A New Enemy is the second campaign level in Halo Wars 2. The Pelican carrying Jerome and Douglas returns to Spirit of Fire. Jerome-092: "Alice is MIA. She'll stay silent down there until she has a good shot at getting back to us." Jerome arrives on the bridge and places a data chip on the bridge's holotable. Isabel's avatar appears, sitting on the holotable. Jerome-092: "Isabel, this is Captain Cutter." Isabel: "I know who you are. James Cutter. Captain of the Spirit of Fire. You're supposed to be lost with all hands." Cutter: "Not so lost, it seems. What happened down there? I need to know what we're up against." Isabel stays silent, refusing to answer. Another pause as Isabel stays silent. Isabel disappears momentarily, and reappears standing. Isabel: "Sir. Five months ago the portal from the Ark to Earth shut down without warning. A month later, he arrived." The bridge falls silent as the crew listens to her. Isabel: "The Brute. Their leader. His name is Atriox." Atriox's past begins to be revealed through flashbacks. Isabel: "During the war, the Covenant used his clans as expendable muscle. Told them dying in battle would "speed their holy journey"." A silhouette appears and the sound of a Gravity Hammer being dragged can be heard. Isabel: "Forty at a time they carelessly sent them in. Forty to break the front lines... forty to die for beliefs not their own... and none ever returned. Until he did." Atriox, alone, reaches a Covenant outpost. Isabel: "And so, battle by battle..war by war..thirty-nine brothers at a time..."
His fellow Brutes start to stand up, watching him. Ahead are three Sangheili awaiting Atriox. Atriox tosses his Gravity Hammer away. Isabel: "With every victory his legend--and his hatred of the Covenant--grew." Atriox kneels in front of the Sangheili. Isabel: "Eventually both were impossible to conceal." A red Energy Sword ignites, preparing to execute him. Isabel: "And they tried to banish him." One of the Sangheili is poised to execute Atriox. Isabel: "In everything we know about the Covenant's thousand-year history..."
Atriox suddenly grabs the grip to defend himself from execution. Isabel: "...Atriox was the first to defy the Covenant and survive." The Sangheili executioner collapses to the floor. Atriox holds the helmet in his right hand and the red Energy Sword in his left hand. Other Sangheili draw their swords in an attempt to kill him. Isabel: "And his defiance inspired others." The other Brutes in the outpost start fighting the Sangheili, while Atriox remains standing still silently. His fellow Brutes kill every one of the Sangheili in the outpost. The scene changes to Atriox and his Brutes opening the vehicle bay, full of Wraiths. Isabel: "Atriox and his Banished raided Covenant resources, cutting a swath across the galaxy; growing in strength with each attack." A group of Sangheili mercenaries pledge their allegiance to Atriox. Enduring Conviction 's fleet can be seen. Isabel: "Gathering killers and mercenaries to his side. The Covenant had two targets in those years. Humanity and Atriox. They almost got us. But Atriox? They never came close." The Banished Army is seen, with hordes of various vehicles, aircraft and infantry units gathering at one location. Isabel: "The whole damn Covenant couldn't contain him at the height of their power." The flashback ends. The scene returns to the bridge of the Spirit of Fire. Isabel: "That's what you're up against. And all you've got is one old ship and half of crew to staff her. We need to run. As far and as fast as we can." Cutter: "We are just one ship. And an old one at that. But here we are.. thirty years past what anyone could ask of us." One crew member starts to stand up. Cutter: "Our war is gone." All the crew stand, listening to his speech." Cutter: "The lives we had are gone. The worlds we knew.. have moved on. And now all that we may have left are those standing beside us... And the DUTY that defines us battle after battle, fighting side by side--"
Cutter looks at Isabel with a commanding gaze. Cutter: "Together. Where you see half of a crew, Isabel... I see family, courage. And a thousand heroes who swore to fight their way through hell before they'd ever...EVER turn their backs and run. And where you see one old ship, I see home. And that is always worth fighting for." Cutter smacks the table. The ship is brought up to Red Alert status. The crew starts working again and a siren can be heard. Isabel looks around the bridge, stunned to see the crew is fully prepared for battle. Cutter opens an inventory hologram on the holotable. It displays several units, including Grizzlies and Spartans. Cutter: "If we don't stop Atriox now, we leave galaxy at the mercy of a monster." Cutter nods to Jerome, who immediately leaves the bridge. Cutter: "So no, Isabel, we won't be running anywhere today." Isabel hears this. She offers a small smile to Cutter. Isabel: "Captain, I appreciate a good rousing speech as much as the next AI, but Atriox has had months to set up his forces on the Ark. Even if we could find him, attacking him head on would be suicide." Captain Cutter: "That's why we have to fight smart by hitting Atriox's chain of command first. Isabel, you know the Banished and their operations here. Where do we start?" Isabel: "Decimus, he's one of Atriox's chief lieutenants and the one who led the attack on my outpost. He oversees a Banished salvage operation near the outpost. Captain Cutter: "We need to hit the Banished with a surprise attack to put them on the back foot, then move south and establish an HQ. Once we have a base, we can begin our attack on Decimus." Anders: "Captain, Isabel said the portal her outpost was using to contact Earth closed without warning. Once we start this fight, we have no way of calling help if we need it." Captain Cutter: "That's what you'll be working on, Professor. I need you to find us a way to get word back home. In the meantime, it is up to us to hold the line here. Let's show them what the Spirit of Fire can do." Lead the UNSC in an assault against Decimus' salvage operation. Hellbringer infantry are standing by to clear Banished defenses. Two Pelicans arrive and prepare to drop troops on the ground. Cutter: "Listen up, team. The Banished are dug in deep and dead set on controlling this installation, and we cannot allow that to happen. The hatches on the Pelicans open, dropping Jerome and several squads of Marines. The Pelicans leave the LZ once the troops are dismounted. Cutter: "Strike One, your job is to establish a forward base. Expect resistance." Jerome-092: "You heard the captain, Strike One. Hit them hard, Marines." Gameplay Jerome leads the Strike One squad to the Banished camp. Jerome-092: "Spirit of Fire Actual, we have eyes on the Banished camp, over." Cutter: "Roger that, Strike One. Take them out. Jerome and the Marines assault the camp. Six Hornets arrive on the scene, assisting them in destroying the Camp along with the units stationed there. Jerome-092: "Camp is clear, area secure." A Pelican arrives and drops two squads of Hellbringers. Cutter: "Jerome, the enemy has troops garrisoned up ahead. I'm dropping in support to help you clear them out. Jerome and the Marines continue until they find a garrisoned area ahead. Jerome-092: "Burn them out, Hellbringers!" After the Banished inside the Garrison have been cleared out, Anders speaks over the comm, having spotted a Forerunner Power Node ahead. Anders: "The Forerunner Tower up ahead is generating an incredible energy signature. If you can secure it, we might be able to tap into their power." Jerome-092: "Got it, Professor. Capture that power node, team!" Jerome leads the Marines to wipe out the Banished forces defending the Power Node ahead of them, allowing them to capture the structure. Anders: "Looks like the Banished are using those nodes to pull power from the Ark - but now i can reconfigure them to supply our bases on the ground." Jerome-092: "Thanks, Professor. I'll keep an eye out for more. Now let's find a way to get across that canyon." Four Pelicans arrive. One drops two Hellbringer squads, while the other three drop a Kodiak each. The Kodiaks soon move into position and start firing. Jerome then activates the light bridge ahead. Jerome-092: "Bridge is up, let's go." Isabel: "Jerome, the captain is deploying heavy forces across the target area, keep an eye out for opportunities to coordinate fire." Jerome leads the infantry across the bridge. They encounter another Banished camp. Jerome-092: "Enemy infantry ahead. Hellbringers, you're up." The Banished at the camp spot them and open fire. Banished: "Humans! Stop them or Decimus will have our heads!" The Kodiaks support the UNSC by firing their artillery at the Augmented Excavators and Structures around the camp. Jerome-092: "Look what we have here. The Banished have been collecting supplies." Cutter: "Collect what you can; we're going to need all the help we can get." The UNSC forces take some damage, but they are be able to clear the camp and destroy the structures. Cutter: "Strike One, you're closing in on Decimus' salvage operations, so I'm sending in some Warthogs to help you scout ahead." The Pelican lands and drops off two Warthogs before it flies away. Anders notices some of the troops have taken some damage. Anders: "Jerome, it looks like some of your troops have taken damage. I've made the Spirit of Fire's restoration drones available so you can call them in for help." The Warthogs scout ahead while Jerome and his units recuperate from damage using Restoration Drones. The Warthogs find a large group of Banished forces near the bridge. Cutter: "Jerome, we're detecting a high number of hostiles beyond that wreck. Use your Warthogs to scout out a flanking path." Jerome and the Marines hold position while the Warthogs take the flank route. They encounter another camp and smaller groups of units. Isabel: "Those wrecks are from the last days of the Covenant. The Banished are repurposing what's left to build new weapons. Scavengers picking from the bones of the dead." The Warthogs flank them and with the support of the Kodiaks, the area is cleared of Banished. They advanced ahead until they find Decimus' base. Cutter: "Strike One, Decimus' salvage operation is just up ahead." Jerome-092: "Spirit incoming, get ready!" Cutter: "Move some troops into those empty garrisons, Jerome. They'll be better protected against the Banished base there." UNSC forces and Banished clash around the base. Cutter: "Jerome, use your Hellbringers' flamethrowers to burn down that base." Jerome-092: "Watch out, team. Enemy reinforcements incoming!" More Banished dropships arrive as the fight carries on. Jerome-092: "There's another dropship on its way!" Six Hornets arrive to assist the UNSC ground units. The base is eventually destroyed. Jerome-092: "Spirit of Fire Actual, we've destroyed the base. Awaiting new orders." Cutter: "This is a good location to establish a base of our own. It's the heart of your operation and once it's constructed you can call in more structures to build an army." Jerome starts calling in the Condor Dropships to transport the Firebase. Isabel: "Captain, I'm picking up a broadcast to local Banished channels." Cutter: "Can you intercept, Isabel?" Isabel: "Routing to you now." Decimus (VOICE COM): "Salvage teams, this is Decimus! Why have you ceased production? Explain yourselves!" Jerome-092: "Sounds like we got his attention." Cutter: "We won't have long before he realizes what's happened. Isabel, keep intercepting those transmissions and sending them through. Jerome, get that base up and running." The Condor arrives and drops the Firebase. The structure is completed with five sockets available. Cutter: "Now that the base is constructed, Supply Pads are online. Build one now." The player calls the Supply Pad for construction. Cutter: "Supply Pads will bring in a steady stream of supplies to help you build your army." The Pelican arrives, dropping the Supply Pad into one of the sockets. Cutter: "Now call in a Generator so you can start producing power." The player calls the Generator. Cutter: "You'll need power as well as supplies to build more specialized units." A Pelican arrives, dropping the Generator into one the sockets. Cutter: "Now that we've got resources coming in, build a Barracks to field advanced infantry squads." The player orders the Barracks. Cutter: "Infantry are your frontline in battle and one of your most adaptable units on the field." Isabel: "Marine infantry squads now available from your main HQ building. Marines are solid all-purpose combat units which can capture objectives and gather resources on the field." The Pelican arrives carrying the Barracks and drops it on one of the empty sockets. Cutter: "You've got a good baseline now, Jerome. Bring in more resources, Barracks or set up some automated turrets to help protect your base as you see fit." Jerome-092: "Thanks, Captain. It's about time we did some damage of our own." The Player starts building a force. Isabel: "Captain, I'm detecting a significant energy build up in orbit above our base!" Cutter: "Plasma bombardment on the way! Take cover Strike One!" The screen moves to the base, where a Plasma Bombardment commences then hits the HQ. Decimus: "So, you've crawled out your hiding places for another battering? I thought we bloodied you enough last time." The Bombardment stops. The base has been damaged severely. Decimus: "That was the taste of our power, humans. If you want more, I'll be waiting." Jerome-092: "We can't turn down an invitation like that. What's the damage?" Isabel: "Nothing our restoration drones can't repair, we were lucky this time. That plasma beam came from the Banished's carrier ship, the one that attacked my outpost! The rest of Decimus' salvage operation is north of your position marked on map. Make him pay." Jerome-092: "We'll be happy to deliver, Isabel. Now let's get going." After building up an army, Jerome leads the troops to the location Isabel specified. They encounter a barrier shield. Isabel: "Jerome, your vehicles won't be able to get past that shield. You'll need to destroy its power supply with your ground troops." The UNSC forces destroy the power supply and find another Power Node. Jerome-092: "Another power node! if we can take it, we'll be starving Decimus of resources." Cutter: "Not to mention bolstering our own income. Secure as many as you can find." 'The UNSC forces find several pieces of wreckage while capturing Power Nodes. Jerome-092: "Isabel, where did all this wreckage come from?" Isabel: "There was a battle here near the end of the war. The Master Chief saved us all." Jerome-092: "It's good to know John's still out there." Decimus: "Do NOT let the humans interfere with our power supply! Get down there and END THEM!" The UNSC later seizes all the Power Nodes from Decimus. Decimus: "Atriox shouldn't have let you escape at the human base! He may have thought it enough to toy with you, but I won't be so kind!" The UNSC starts pushing again..
Isabel: "I'm detecting another energy build up, take cover!" The Plasma Bombardment commences again but this time it goes towards the UNSC forces instead of the base. Decimus: "Run as you did before! You will burn like all we killed here!" The UNSC force manages to avoid the Plasma Bombardment and continues pushing forward until it encounters Hunters at Decimus' base. Jerome-092: "They got Hunters! Hellbringers, take them out before they can destroy our Warthogs!" Cutter: "Remember your Marines are equipped with grenades; use them to destroy that base." The UNSC encounters more resistance, but manages to destroy the base. A portal appears, and Decimus comes through. Jerome-092: "I'm guessing that's Decimus." Isabel: "He looks bigger than the last time I saw him." The battle begins between the UNSC and Decimus. Decimus: "I will hollow out your skulls and let the short one use them as toys!" 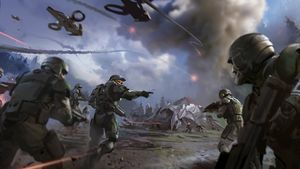 The UNSC keeps fighting regardless. Jerome-092: "We've damaged his armor! Don't let up!" Decimus' Power Armor finally breaks, but he orders another Orbital Strike right at his position. Alarms ring. Decimus: "Shipmaster! Put an end to these creatures!" Cutter: "Decimus is ordering a bombardment on his own position from the carrier! Fall back!" Decimus activates a shield to protect himself while the bombardment commences and strikes right at his own position. The UNSC force moves out of bombardment range. Decimus: "The Ark is ours, humans, and no one will stand before the might of the Banished!" Banished reinforcements are inbound, but they are immediately annihilated by UNSC forces. After Decimus loses 1/3 of his health, he issues another Orbital Strike. Decimus: "Orbital strike on my mark!" The UNSC moves away from the Orbital Strike radius again while Decimus shields himself from the blast once again. After the Orbital Strike, the UNSC continues to battle Decimus again. More reinforcements from the Banished arrive, but the UNSC manages to repel them. When Decimus' health drops to 1/3 of his original health, he orders another Orbital strike. Decimus: "Shipmaster! Keep firing! Incinerate them!" UNSC clears away once more and once the Orbital strike is finished, the battle continuese. Jerome-092: "We have him on the ropes! One last push!" The UNSC succeeds in beating him down. Two Kodiaks and two Grizzlies attack Decimus as the UNSC forces engage the Banished squad by squad. Cutter: "Watch out, you've got incoming!" A Plasma Bombardment destroys a Grizzly as Decimus make his escape through the portal. Decimus: "I'm impressed, humans..but we'll meet again." He disappears through the portal while the Plasma Bombardment eliminates units around him and the portal. Jerome-092: "Now he's bombing his own base?" The Plasma Bombardment destroys not only the UNSC, but also fellow Banished on the battlefield. Isabel: "Monster. Killing his own as casually as he kills us." Cutter: "Decimus must be trying to hide something. Search what's left." After the Bombardment ends, a Nightingale arrives to evacuate the casualties while the Marines search the remains of Decimus' base. Jerome-092: "We've found something, Captain. Uploading now. Isabel, can you decrypt this for us?" Isabel: "Oh, this isn't good. I'm only recovering bits and pieces of data, but it all points to a Cartographer." Jerome-092: "The Cartographer? Who's that?" Isabel: "Not 'Who'. 'What'. I'll debrief you when you're back on the ship. This is going to take a lot of explaining." A Warthog arrives while Nightingale leaves. When Decimus issues Orbital Strike for the first time, the UNSC base's health is capped at half regardless of any remaining health points on the UNSC base. Players can found another base if they go southwest from Decimus' base. This can be utilized as a Battle Base for faster reinforcements. Capture all Power Nodes to save some building sockets for Supply Pads. Bring some Marines to deal with light armor units but keep the main force as Hellbringers since you will encounter more infantry than armor.